I am a Nail Technician/Cosmetologist since 1982. I’ve witnessed how dramatically the nail salon industry has changed, and it hasn’t always been for the good. There has been a price war in the nail industry which started around the mid 1990’s that has brought on many of the illegal activities we see in the news today. The recently published NY Times expose “The Price of Nice Nails” and “Perfect Nails, Poisoned Workers” has brought some of the problems within the Nail Industry to light. While underpaid and exploited immigrants is a huge problem, there are other problems within the nail industry that were touched on by these two informative articles. 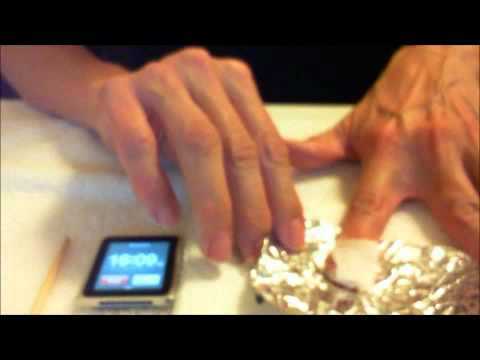 Here is how to be a knowledgeable and conscientious nail consumer. 1. Make certain your nail technician and the nail salon are licensed. 2. 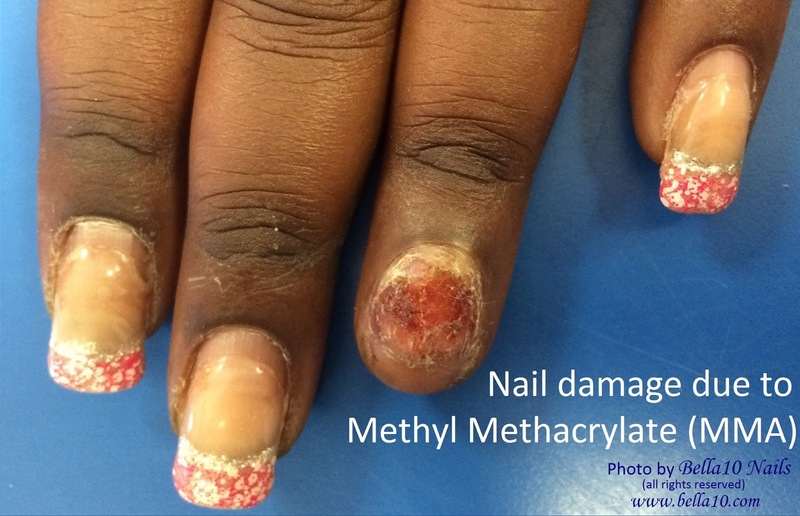 Try to avoid salons who use illegal products , like Methyl Methacrylate (MMA) which is banned by the FDA for use as Acrylic Nails. 3. Look around, be aware. Are the tools, towels, manicure and pedicure stations sanitary? To help you to understand about licensed and unlicensed nail technicians and nail salons, let me say that most states require licensing for nail technicians and salons. Depending on the state, there may be legislation in place for nail tech “trainees” or “apprenticeship”. In the NY Times articles mentioned above, unlicensed nail salon workers are mentioned. A nail salon owner will issue an American name to an immigrant, so how can the customer know the immigrant’s real name which should appear on their nail tech/cosmetology license? Ask the technician questions and look for the nail salon license and the expiration date and also ask to see the technician’s nail tech license. These licenses must be publicly displayed. A big issue, and one that is hard for the unsuspecting consumer to detect, is the use of illegal products, such as Methyl methacrylate (otherwise known as MMA, an FDA banned acrylic liquid). MMA is regularly used in nail salons who discount their prices so low as to compete with other nail salons. According to ABC News “Some Nail Salons Still Use Dangerous Liquid”, 20/20 Investigates found eight out of the eight Dallas, Texas nail salons were using MMA liquid. In 2014, 20/20 Investigates noted that 14 out of 26 nail salons in the cities of Phoenix, Boston, Houston and Dallas, were using MMA liquid. That is more than half of the nail salons across the country are using MMA. § MMA usually looks cloudy and not clear. § MMA nails don’t usually break like other acrylic nails. They will usually rip completely off and take the nail bed with it. MMA has been banned in the USA by the FDA for use on nails. are using MMA on unsuspecting consumers. Lack of sanitation is a factor in some nail salons. Yes, nail salons are regulated and inspected but unfortunately, some sanitation requirements are lax in the assumption of getting the clients in and out quickly. There are many articles and TV news reports, that can be found online, on the lack of sanitation. Staph infections can spread easily along with toenail fungus and other micro-organisms that can cause all kinds of infections. 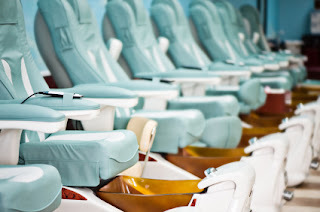 A client of mine, who is aware of sanitation requirements in a nail salons, reported that she was in a Texas nail salon and watched technicians use a warm wet towel on a client and after it was used it was placed in a dryer to be used on another client. She also noticed implements being used on multiple clients without cleansing or disinfecting the tools. That’s just plain NASTY! There is a positive note to the New York Times expose on nail salons. New York is changing legislature to help prevent the exploitation of the immigrant workers and to aid them in becoming “trainees” and to assist in education surrounding sanitation and bacteriology. There are many nail salons and nail salon owners who are legitimate in how they run their salon. Cleanliness, sanitation and state beauty culture rules and regulations are observed. The nail salon industry is a 7.9 billion dollar industry, but at whose expense. Be a knowledgeable and conscientious nail consumer. Be aware. There is a website that can help consumers find safe nail salons, it is safesalonrating.com and I recommend their ”Study Guide List of Questions” and their “Before Booking an Appointment” pages. For more information on ethical nail care, especially in NYC, check out the website handlewithcarenyc.com, #handlewithcare. Welcome to the second half of my summer nail polish surprise! In my prior post I mentioned that I happened upon a shop called Life on a Sandbar in Nags Head, North Carolina while on a family vacation. Once there, I saw a sign for a Del Sol Nail Polish. I was familiar with Del Sol color changing T-shirts, since I purchased one once at a shop in Virginia Beach several years ago. I didn't realize that Del Sol offered nail polishes now, so I had to check them out. 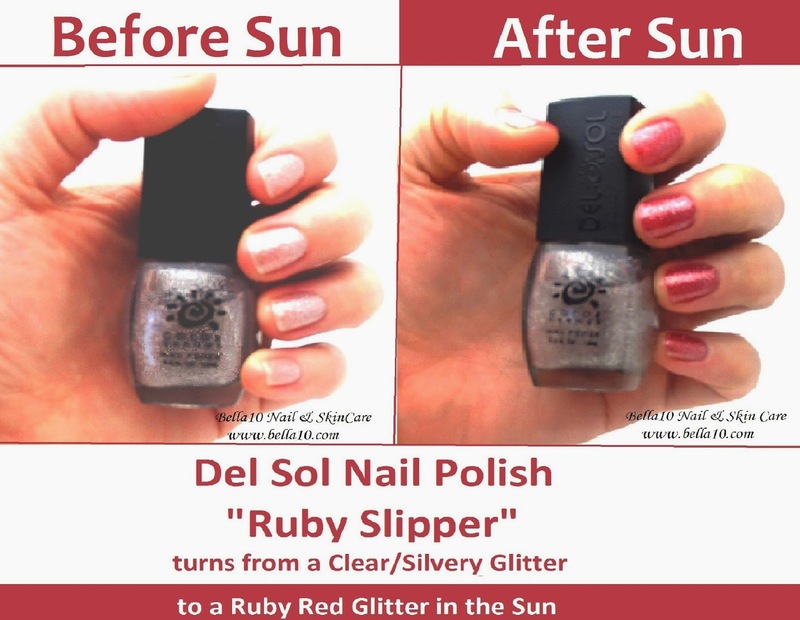 For those who missed my last blog and to those who are unaware, Del Sol makes t-shirts and now nail polishes that change color in the sunlight. The colors in the products use a technology that was developed by NASA called SpectraChrome. To explain it simply, SpectraChrome acts like a flower in sunlight, opening when it hits the suns rays to reveal the inner color. With the nail polishes, it seems that you can have almost any color on the outside and then when the sun hits the SpectraChrome molecule, it opens to reveal it's inner color. Nina, the manager at Life on a Sandbar was extremely helpful in finding four polishes for me that had some extreme color changes in the nail polishes. The second two I want to show you today are Electrik and Glitz & Glam. I really liked Electrik, and so did some of my clients, because of it's frosted teal blue. Again, the frosted color went on pretty smoothly, as frosts go, and the color was a gorgeous shade of teal blue. While you can't see it so well from these photos, Electrik goes from a teal blue to a Mint Green in full sun. Check out the next photo to really see the difference. Again, since I am such a "green girl" I just loved this one. The next color I want to share with you is a glitter polish called "Glitz & Glam". It is such a pretty medium iced blue that turns glittery purple in the sunlight. Even better is a pic of Glitz & Glam in full sunlight! I have some "die-hard" purple fans amongst my clientele (they know who they are) and I thought they were going to fall off their chair when they saw this color in the sunlight! I would like to thank the folks at Life on a Sandbar for introducing me to these fun nail polishes! 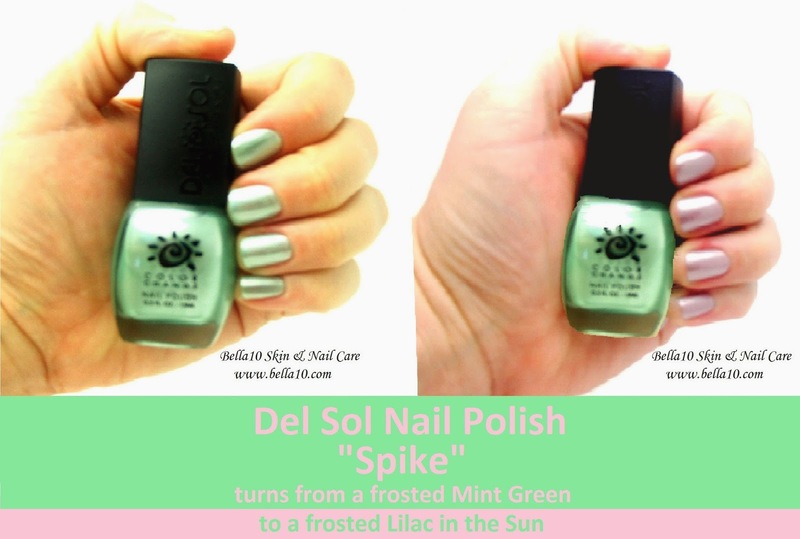 And if you wanted to see more of these colors, this is not my last blog on Del Sol color changing nail polish collections. There are more on their way, complements of the Del Sol shop in beautiful Sedona, AZ. 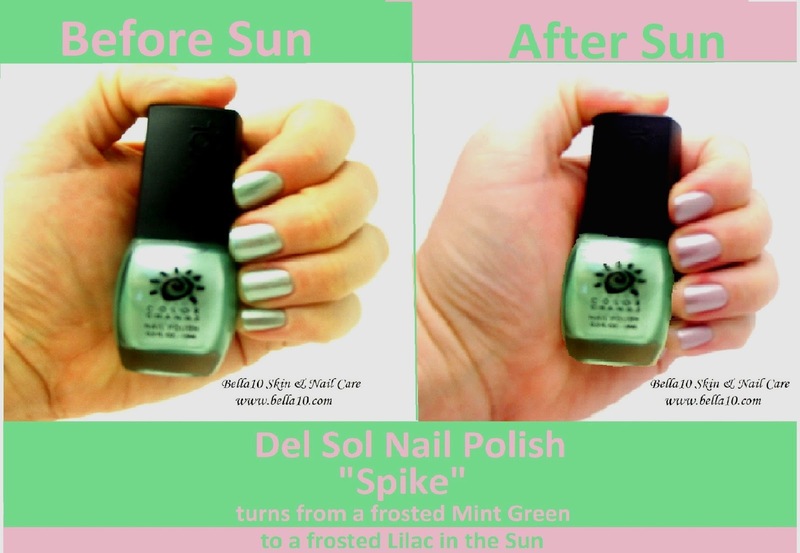 If you missed the first blog, check out "Fun in the Sun - Color Changing Nail Polish! 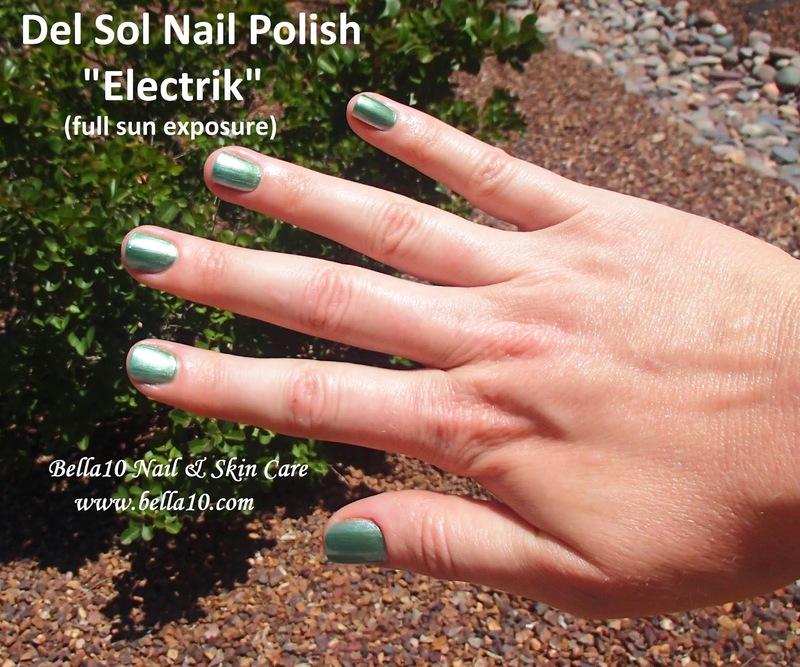 - Part 1"
Don't forget to enter our Del Sol Nail Polish Contest! 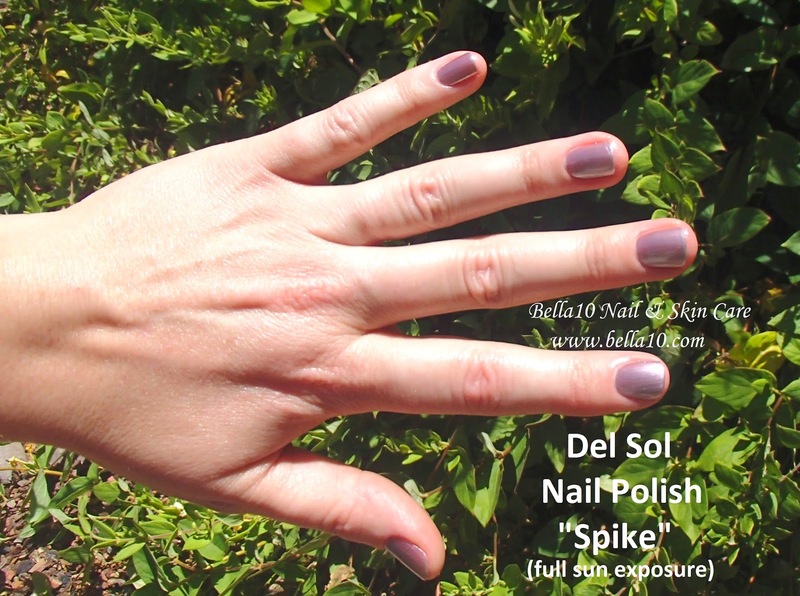 Stay tuned for more Del Sol Nail Polish colors to come! Summertime is for fun, sandals, beaches, sand and FUN polish colors! Sure, you can wear a french but that's boring compared to what I found when I was on vacation on the Outer Banks of North Carolina. I happened upon a shop called Life on a Sandbar in Nags Head near a fun kite store. I saw a sign for a Del Sol Nail Polish. I had been in a Del Sol shop in Virginia Beach, and purchased a T-shirt several years ago, so I was aware of the color changing properties of the Del Sol products. I didn't realize that they offered nail polishes now, so I had to check these nail polishes. 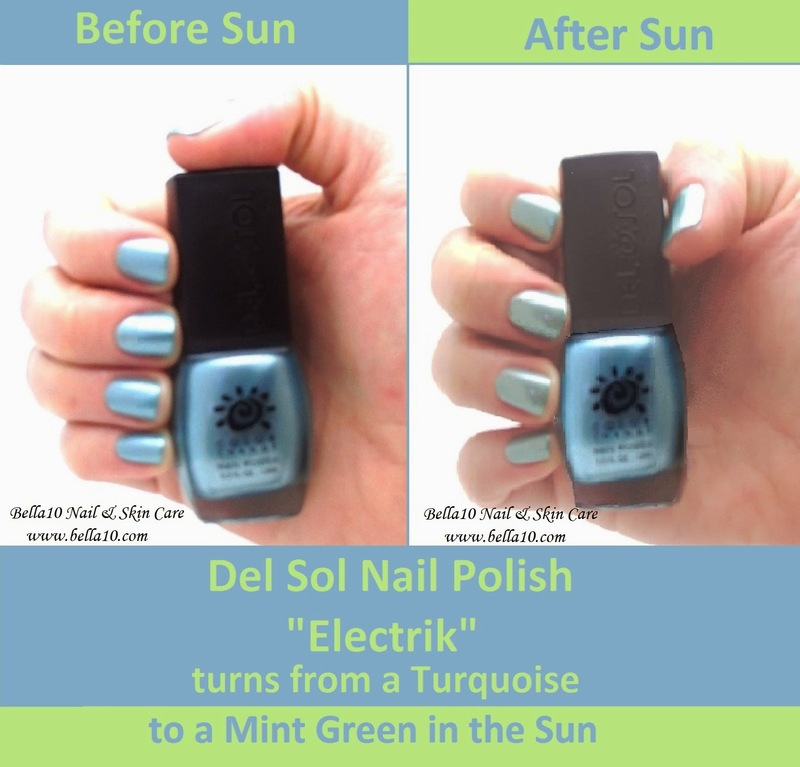 For those who were unaware, Del Sol makes t-shirts and now nail polishes that change color in the sunlight. I had purchased a cute black and white t-shirt that, in the sun, changed to beautiful pinks, blues, greens and violets. The first color I'll share is Spike. Spike is a very pretty frosted mint green. I loved the consistency of this frosted formula. I know frosts are sometimes hard to apply for most people. They tend to look streaky, but this formula didn't seem to have that much of an issue to make it look smooth. Since I am a "green" girl, I fell in love with this shade without sunlight, but in the sunlight it turned a light lilac. The second color I will share with you today has been, so far, my client's favorite! It's called Ruby Slipper. Sometimes I wish I was a professional photographer, but alas, my skills are more in manicuring than in photography. I wish my photographic skills were better, but you have to admit, the color change effects with the Del Sol Nail Polishes are stunning. As I said, this is my client's favorite for now. 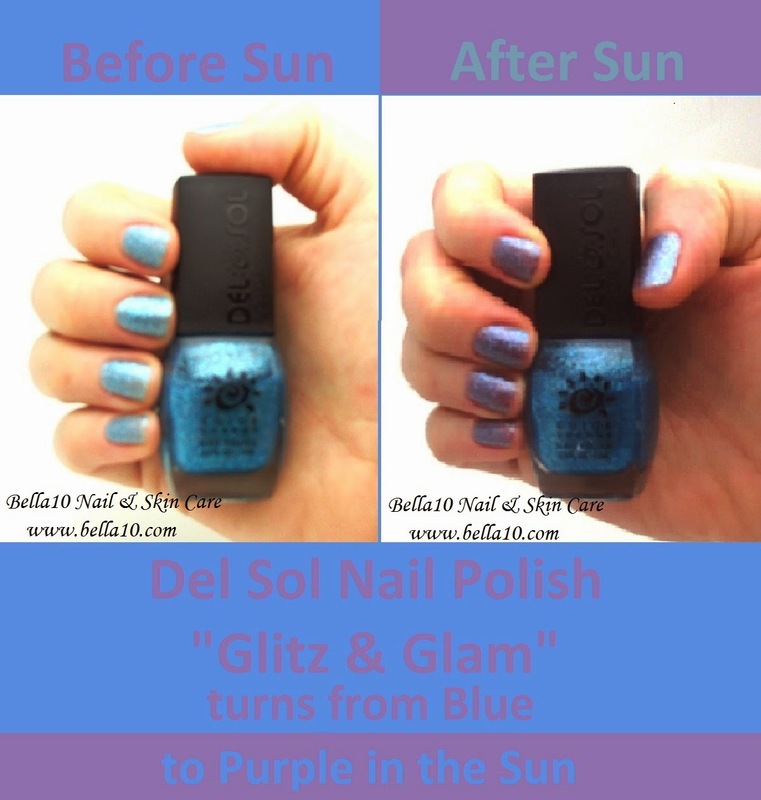 I will share with you the next two colors in Part 2 of "Fun in the Sun - Color Changing Polish!" next week! Enjoy the colors and remember, shop local where you can. If you find yourself on the Outerbanks of North Carolina, specifically Nags Head, check out the shop Life on a Sandbar. Nina is really helpful and they offer a Buy 3. 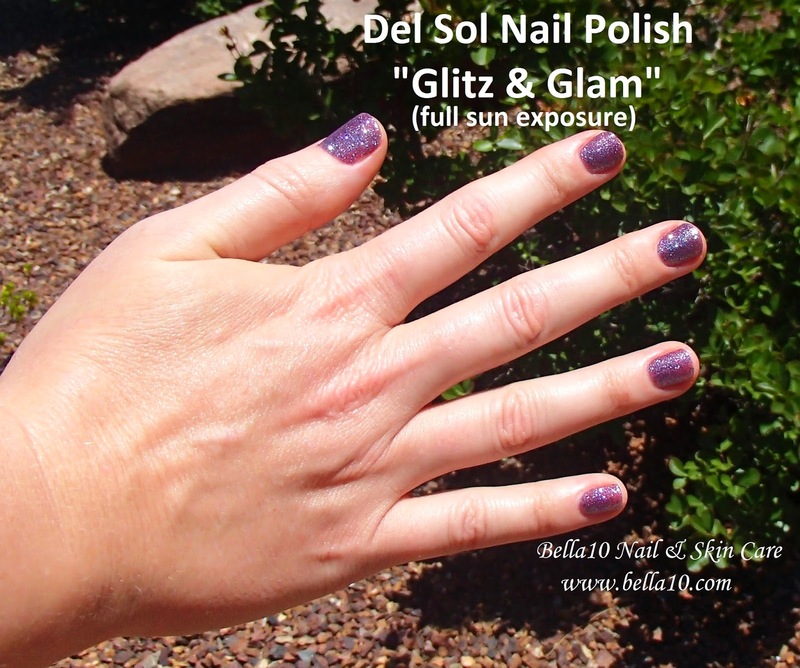 Get one Free deal on their Del Sol Polishes. You can also find a local Del Sol store by going to http://www.delsol.com/stores.html. 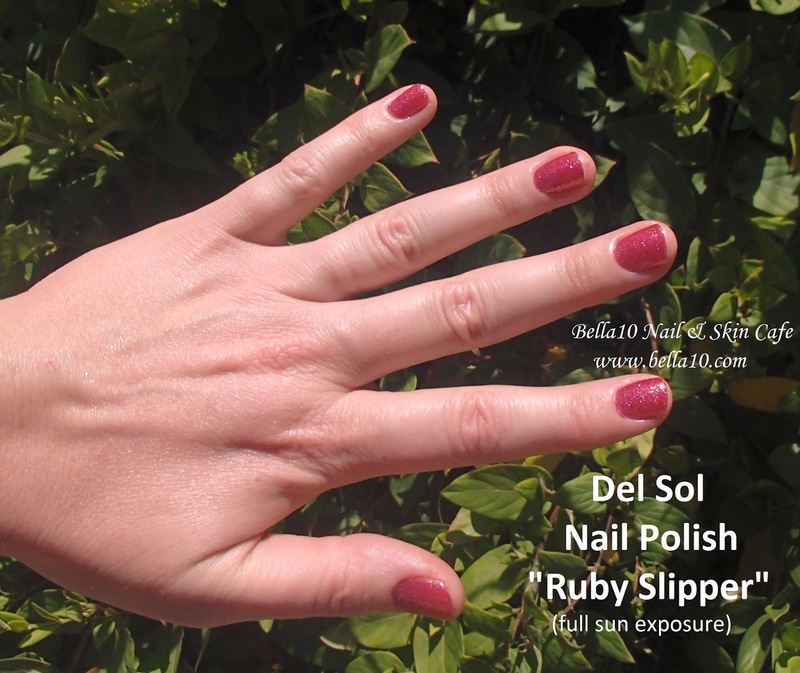 Or you can purchase online at http://www.delsol.com/womens/nail-polish.html. Bella10 is giving away a free bottle of Del Sol Ruby Slipper and CutiOil,1/2 oz and the 2 oz Refill Size. To enter click on the link below. Don't forget to check out "Fun in the Sun - Color Changing Polish!" Part 2. I was recently asked by a friend for help with her nails... "My nails have been breaking a lot all of the sudden." And if you are having sudden problems with your nails breaking, peeling nails or split nails, here are the questions you need to ask yourself. Even if you are not honest with your nail technician, be honest with yourself. 1. How long are your nails when they break and how you are using them? If they get too long they will break easier. Don't wear the free edge (white part of the nail) longer than half the length of your nail bed. 2. 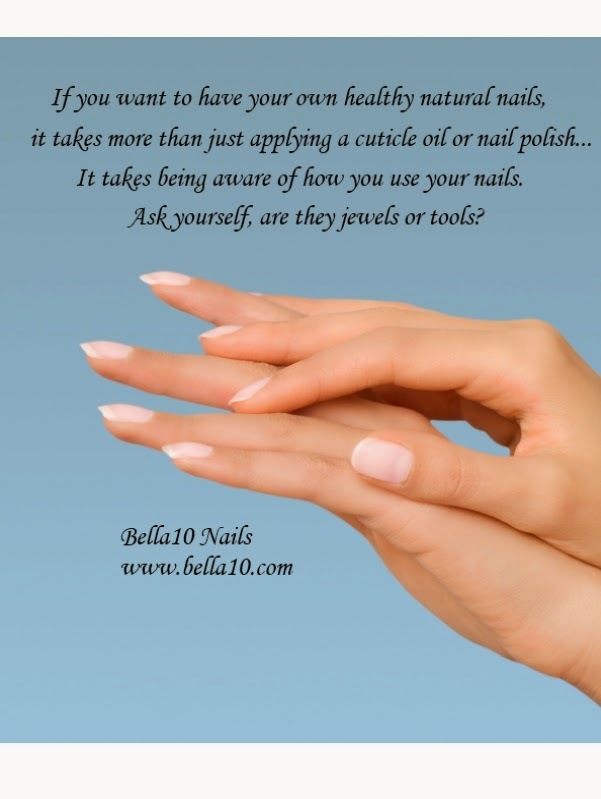 Have you been using your nails as tools or jewels? "Does my nail look like a screwdriver?" "Can I use my nail like a screwdriver and not have it break? Also, if you love certain types of hobbies or work that is hard on your nails, use gloves. They will protect your nails better than going without them. Lets be honest... If you use your nail as a screwdriver, they will break. 3. Have you been eating right within the last 6-8 MONTHS? Is there Biotin in you vitamin supplements you are taking? Are you drinking enough water? Healthy foods rich in natural vitamins and minerals along with supplements that have biotin will keep your nails (and hair) healthier than having a cheeseburger and fries. Drinking your daily supply of water makes for healthier nails too. It is a good rule to drink half your height in inches to that amount of ounces of water. Example: If you are 5'4" tall, your total inches would be 64" tall. Divide 64 in half which equals 32. You should probably be drinking approximately 32 ounces of water every day. 4. 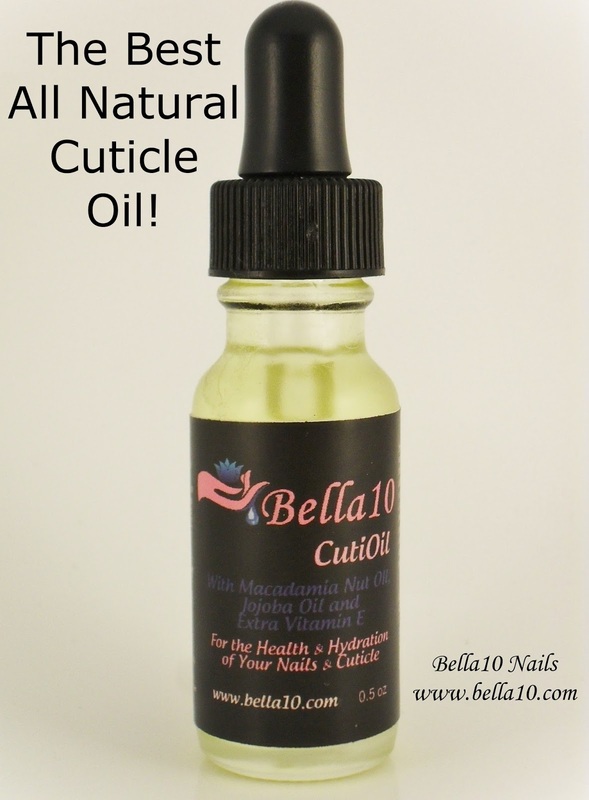 Are you keeping your nails hydrated with a good cuticle oil? Lotion on your hands doesn't necessarily mean better hydration for the nails, they need oil to keep them flexible. Lotion is made mostly with water and nails need water from the inside, not from the outside. Which brings us to the next point. a specific blend of natural oils and vitamins to hydrate the cuticle and nail. Regular daily use will minimize breaking, peeling and splitting nails. 5. Have you been in a lot water or in a lot hot water lately? Strong chemicals? Do you wear gloves when doing house chores? Water swells individual nail cells and softens the protein that holds those cells together, kind of like glue. Being in water a lot will leach the natural oils which keeps your nails flexible and keeps the protein from drying out. Hot water expands the nails further and when they are combined with detergents and cleaning chemicals, this will leach out the natural oils from our nails even more, leaving them dried out and brittle. Solution, use only warm water, not hot. This will reduce the drying effect. Also it is wise to wear gloves when using cleaning chemicals. Being in too much hot water = Your nails will be prone to splitting, peeling and breaking. 6. Do you keep polish on them? Even clear polish adds a layer of strength and protection to the natural nail. There are also gel polishes that can add strength without the constant application. A warning on gel polishes though, they are very strong and if the gel polish is peeled off or removed incorrectly or if the nail is buffed too much on top of the nail, your nail will weaken dramatically! It will be as if you have just removed artificial nails. From "8 Tips on How to Grow Your Nails Faster and Stronger"
Bright cream colors abound this season! 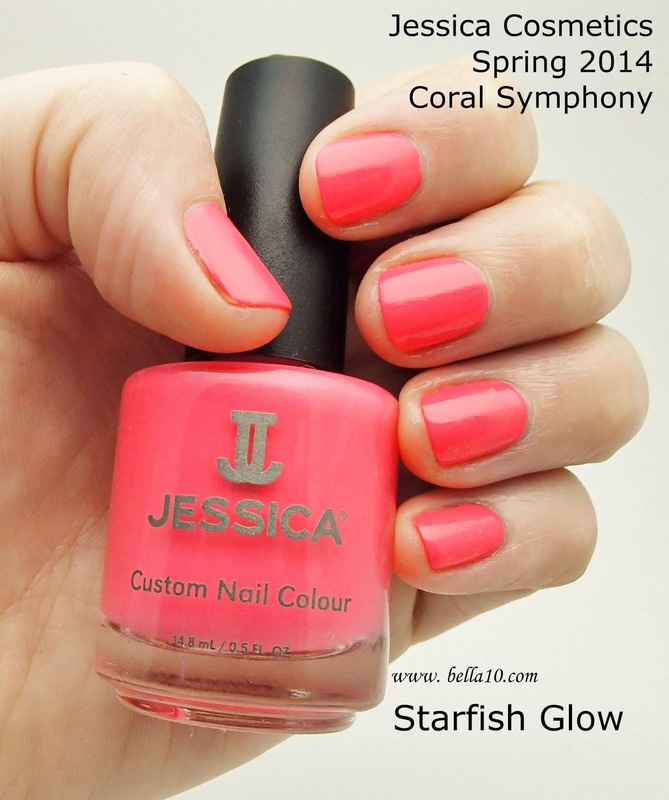 This season, Jessica Vartoughian, founder and CEO of Jessica Cosmetics International, brings you to the coral depths of a warm gulf reefs filled with a glowing creamy collage of various pinks, corals and glowing whites! 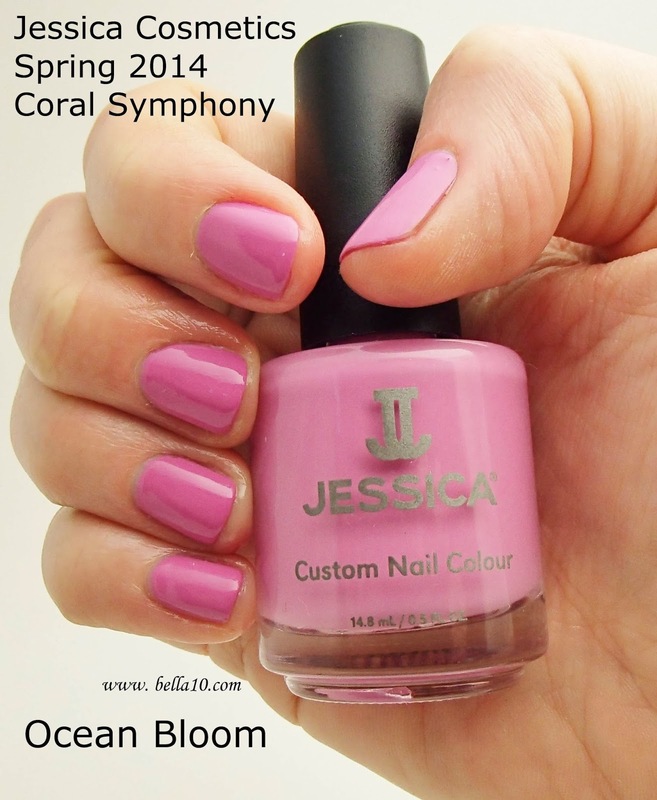 I've always been a big fan of Jessica Cosmetics nail treatments and color polishes. They last much longer than most of the major professional brands I've used. As always, Jessica Cosmetic color polishes are Three-Free, that means they are Formaldehyde, Toluene and DBP (Dibutyl phthalate) free. 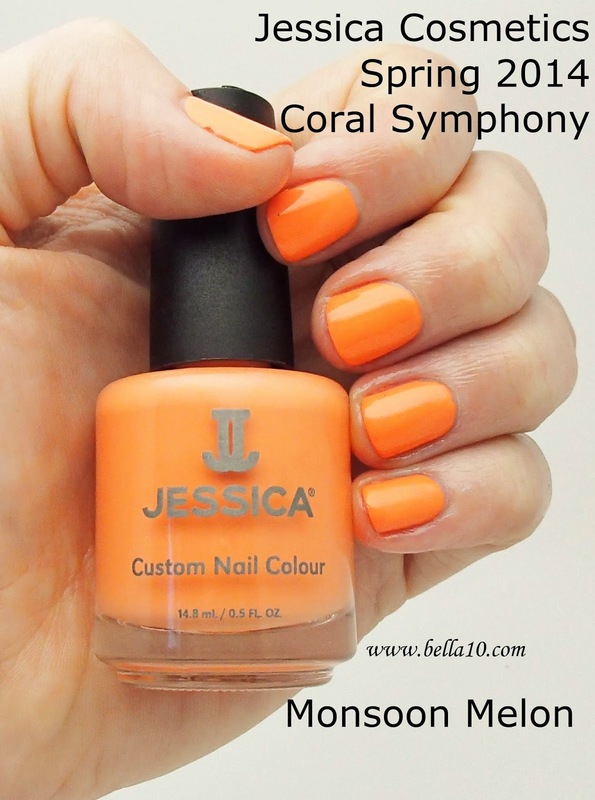 Jessica Cosmetics nail colors and treatments have always had longer wear and less chipping, and now they have a new "STRETCH FORMULA" that stretches while drying to reduce chipping even more! It expands as it drys so it will move with the natural nail for increased wear-ability. Their colors are intense, rich, and they flow without the streaks or lines that you find in other brands. So what are this season's colors? I'm going to show you from left to right of the above photo but on my model's nails. You'll notice that glossy Cream colors are hot this season! Ocean Bloom is a lavender infused pink that is reminiscent of a sea flower. I will admit that all of these colors just make me want to try snorkeling as soon as I find myself near the ocean. Can Starfish look as vibrant as Starfish Glow? This reminds me of a newer, more modern version of an 80's neon pink. (Yes, I was doing nails in the 80's) I believe I may have actually seen this lively color on the tips of a starfish I received as a kid. Monsoon Melon does not remind me of a desert monsoon that I see so often in the South West. This color shines forth like a creamsicle on steroids! And I don't mean that in a bad way! This coral is the height of summer fashion. Try it, I just know you'll love it as much as my model and I did. Tropical Sunset has to be my client's favorite color so far this Spring. 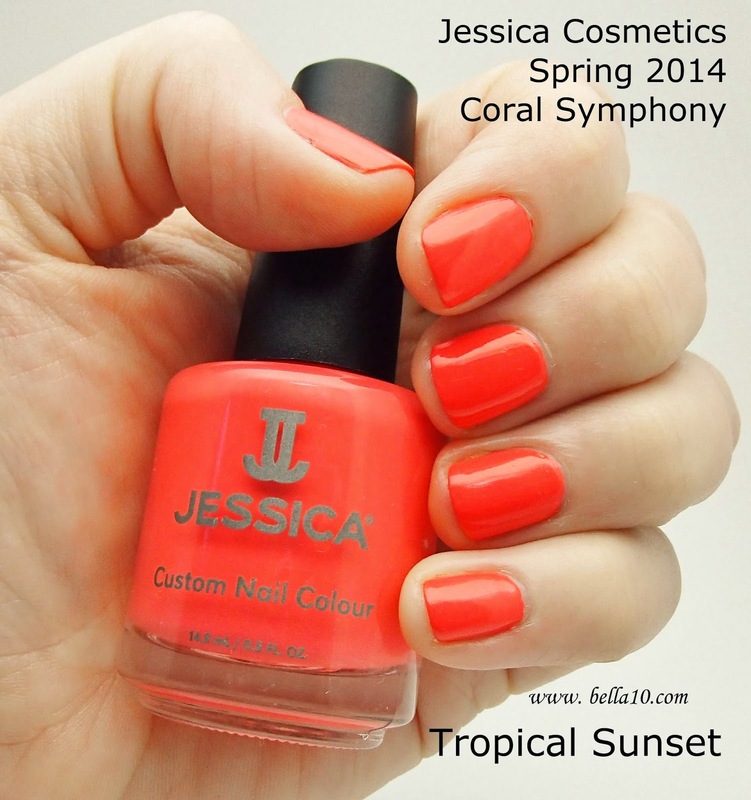 Hot coral and yes, Tropical Sunset is about the best name that could be given to this rich exciting color! Do you want a bright, bright, pure white to give your nail art some pizzazz? Use it as a french tip, as a base below your glitters or add more punch to your nail art. This color does not streak! It goes on smooth and flawless! I think I found Barbie's color for this spring season! lol Conch Shell is the perfect pink for those that cannot part with their seasonal pinks. The coverage is smooth, creamy and like all the colors in this collection, it is reminiscent of all the high colors you'd expect to see in a coral reef. has to offer for natural nail care, check out their website! Bella10 is quickly becoming one of the leading Arizona organic products on the market today after receiving a recent toxicity ranking of 1 from the Environmental Working Group for their signature product, Crème de la Bella. 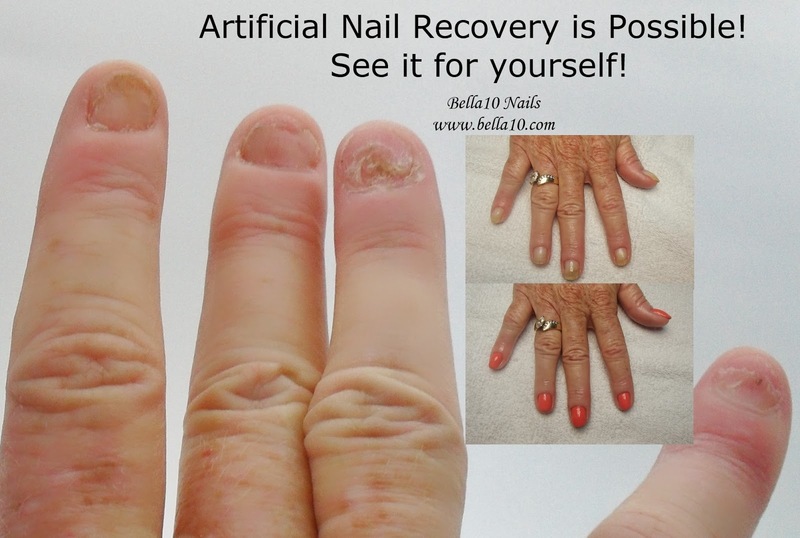 Founded by Alicia Lyons, Natural Nail Care Expert, Bella10 is quickly becoming one of the leading Arizona organic products on the market today after receiving a toxicity ranking of 1 from the Environmental Working Group. Lyons has been in the nail care industry for over 30 years and is the author of The Secret to Beautiful Natural Nails. Bella10 products can be found in several Northern Arizona retail stores including: Crystal Magic in Sedona and Chocolate Blonde Salon in Cottonwood. The Bella10 signature product, Crème de la Bella, was designed to be a very lush yet all natural lotion that leaves skin hydrated and smooth with no greasy feeling. Crème de la Bella was recently reviewed by the Environmental Working Group and received 1 for product purity, 0 being water up to 10 being Formaldehyde (EWG rating for Creme de la Bella Hand & Body Lotion). Bella 10 uses a blend of organic butters and oils to help to maintain the precious elasticity of skin, as well as an array of natural vegan botanicals that eliminate free radicals while soothing and rejuvenating skin. All ingredients used in the line are naturally derived and never test on Animals. Bella10 products are also Petro-Chemical, Paraben and Phthalate free. 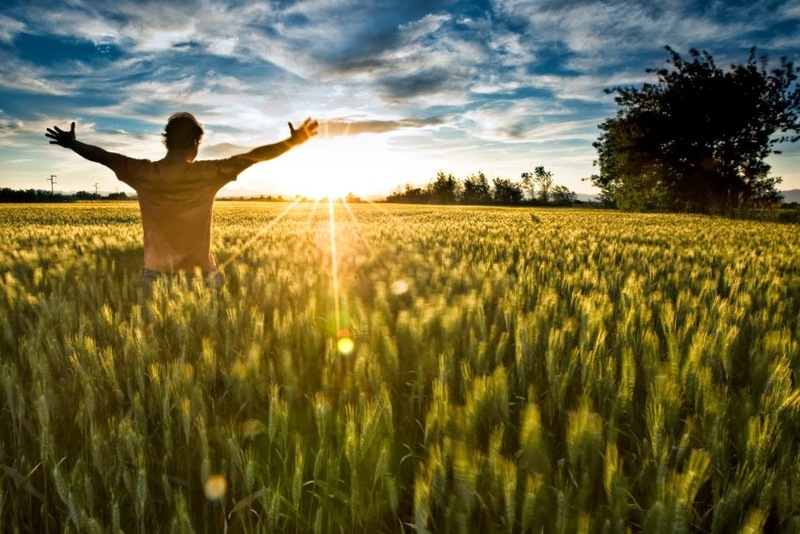 Lyons realizes that most individuals may not fully understand the importance of natural body care and the significant impact it can have on the human body. She believes that to properly care not only for outside appearance but inside as well, people really need to take a moment to reflect on their daily habits and how the environment that they are constantly being exposed to may be affecting them. With the ever increasing awareness of the carcinogens in the air and how skin is constantly absorbing them, customers can trust in the quality and purity of one of the finest organic lotions in Arizona. About Bella10: Bella10 strives to bring personal and professional Natural Nail care knowledge to a whole new level with one of the finest organic lotions in Arizona. For more information, visit: http://bella10.com/.